awesome! i bet jeff is going to put up something as characterless as his markham house! hoorah progress. maybe the state of things with frank stasio could come do a report on this. brought to you by the aluminum company of NC! (it kills me that he sponsors NPR). "there are some words that shouldn't go together, pizza and california, pumpkin and beer and now aluminum and siding." I find this disappointing in particular because there are buildings in this neighborhood that I would love to see torn down: for example, the hideous, 1950's-era, cement-block duplex behind me on Knox St. I know the owners of that duplex and I can't help but think that some kind of swap might have been possible: Knox St, for Lawndale; Monsein builds a new house on Knox and the other owners restore the house on Lawndale. But before people simply savage Jeff Monsein, it's important to understand that other people bear some responsibility for making historic preservation more difficult than it needs to be or ought to be. I talked to Jeff Monsein some last summer, and from a few comments he made, I think he is extremely wary about dealing with Preservation Durham, as indeed I am. Look at the "protective covenants" on their website, and you'll see why. When I showed them to a lawyer/friend, he said, "You'd have to be crazy to sign this." Among other things, the covenants required me to buy insurance to cover Preservation Durham's "interest" in my house. Don't ask. Then there's the city. I had to pay $6,114.81 (in cash, upfront, thank you very much) to connect my house to existing water and sewer lines on Edith St. If Jeff built a new house on a vacant lot in Old West Durham (assuming he could find one), he'd have to pay a similar amount. But if he tears down an existing house, and builds a new one on that lot, he doesn't have to pay that outrageous fee at all. So the city "incents" him (to use MBA speak) to tear down existing houses. And did I tell you about the city's impact fees? It's the same foolishness. What I am trying to suggest here is that Jeff Monsein and other landlords can be part of the solution but only if we have a city government and preservation organizations that encourage solutions rather than creating more problems. If you want to talk about incentives, why isn't all of OWD a National Register historic district? The tax credits offer people a significant incentive to renovate their homes and retain historic features (windows, anyone?). Elizabeth: I agree with you. I suspect that the reason that all of OWD is not part of the National Historic District is that it is expensive, complicated, and time-consuming to go through the process of adding to (or creating) a National Historic District. I didn't expect any tax credits when I moved the Hobgood-Tate house, and I didn't get any. But I also didn't expect to pay $7,280.37 to the City of Durham for water service and "impact fees." So before we even talk about tax credits, is it too much to ask that the city stop punishing people for historic preservation? Jeff Monsein and his family's company have profited nicely from Durham for "over 40 years." Trying to legitimize irresponsible behavior by sponsoring NPR, supporting Durham Academy or reacting to fear over Preservation Durham's well intentioned covenants just doesn't wave a magic wand over one's selfish need for profit. Feed your family, live well, but not at the expense of the character of our city! Isn't it time that "developers" like him take a little personal responsibility for maintaining what has made Durham attractive to thousands of residents over the years? Jeff, if Preservation Durham's covenants seem onerous, have your own legion of attorneys write a few. Its time to give a little back. It rings a bit hollow to me to hear about your "good deeds" regarding moving houses, and NPR when it appears that you really care for neither. I feel certain that if someone came to your neighborhood and unilaterally began removing houses for profit and replacing them with aluminum sided characterless "retro" homes you'd be the first one howling. What gives you the right, besides wealth, to "Disneyfy" Durham's neighborhoods by replacing its historic housing stock. 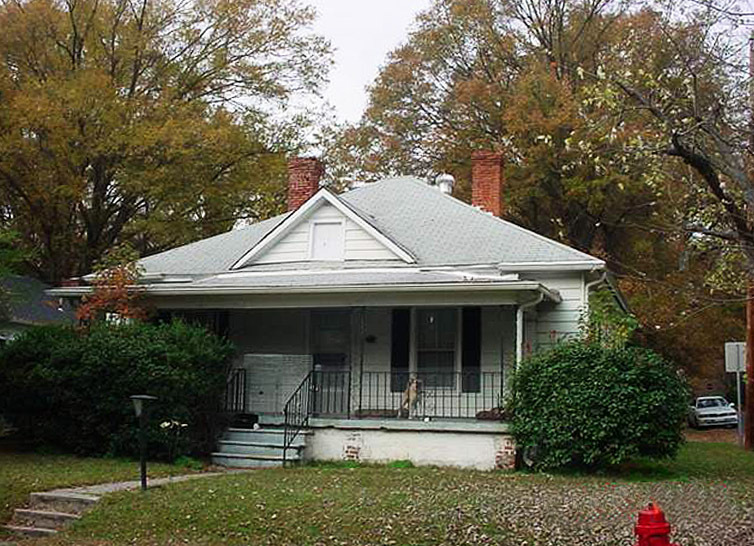 If you have the capital to teardown a home and replace it and still make a profit you have the ability to influence both the City of Durham and Preservation Durham. Instead of being spooked by well intentioned preservationists why don't you use your resources to create an atmosphere where you can make a living, yet not destroy Durham's architectural heritage along the way? I won't even begin to discuss the ecological issues surrounding your teardown activities. You do have children who will have to live with landfills full of your lead laced, yet still superior building materials? What ever happened to personal responsibility and respect for history, ecology, and community? I agree with lwn about personal responsibility, but surely the city could also take a look and modify its fees so that we are actually promoting the behavior that we want to see in our community. Why is that so difficult? Elected officials? Are you listening? We need a change here. Mr. Monsien is certainly no freind of preservation, and his recent unfortunate work in the historic districts will no doubt to long term harm to their communities. It's my understanding he skirted Trinity Heights' cetificate of appropriateness process on his Markham house, and got little more than a slap on the wrist as penalty. So much for the stick of regulation. I do believe reasonable neighborly peer pressure can go along way here: "We're sure you do great work, and have a reputable company. We'd like you to do it somewhere else". Some will listen to that approach. Others wont. Presented persistantly over time, it should drive away plasitc box developers with any sense of community. Thanks for the post about the house. It's a shame when these threads of our neighborhood are lost for mere convenience. I went into the house on the day of demolition and saw very little that would warrant its destruction: heart of pine floors needed refinishing but were in good shape, plaster walls were smooth and without cracks, there were nice doors, mantels and no evidence of any foundation problems. It was a shame to see the entire thing sent to the landfill. They also took down the 8 foot diameter Willow Oak on the property without producing any lumber whatsoever from it. 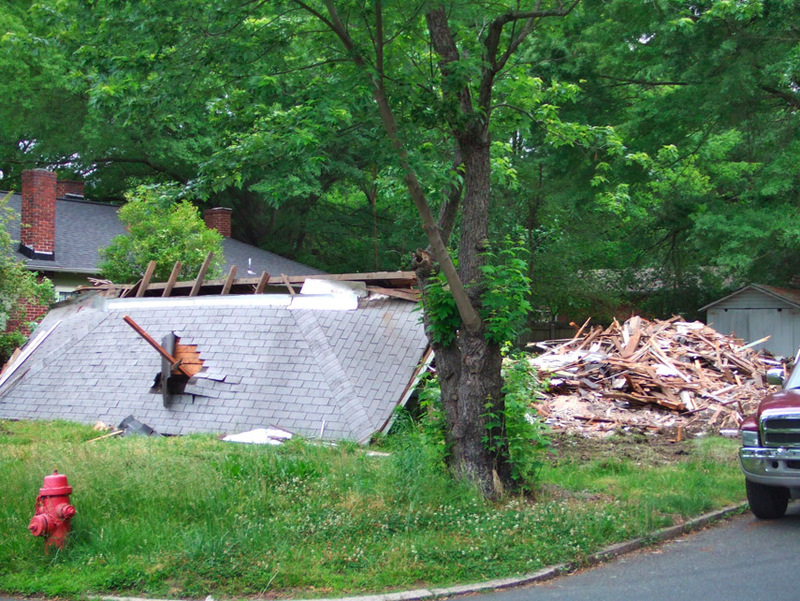 For the record, 2 of the mantels, some flooring, and a number of wheel-barrel loads of brick were salvaged by folks. Its fascinating to read comments from people who cannot know Jeff Monsein, or you wouldn't make the comments that are in these posts. I would encourage you as preservationists to purchase an old home or two in OWD and see why Jeff makes the decisions he does. I would think that the environmentally sensitive would be personally sensitive to getting to know him well enough to know that he IS concerned about the neighborhood. Sorry he's not doing it just like you want him to, but I can assure you it is a better neighbor because of the impact he's had on it. I wont get into the structural problems that this property had or some of the new features like bamboo floors, Renai tankless waterheater, etc. But it is interesting to read where our mantles went and that the righteous among us have no problem "salvaging" them without asking the owner first. I'd be glad to host a "beer summit" and discuss these matters further with any concerned because the renovations will be continuing for years to come. We'd welcome kind and thoughtful input but the other won't have much of an impact. I can be reached through APPLE Realty. So, if I let you buy me beer and say kind things to you, you and Jeff will stop tearing down old houses? You are an incredibly giving and generous man to make such an offer, and I'll take you up on it! 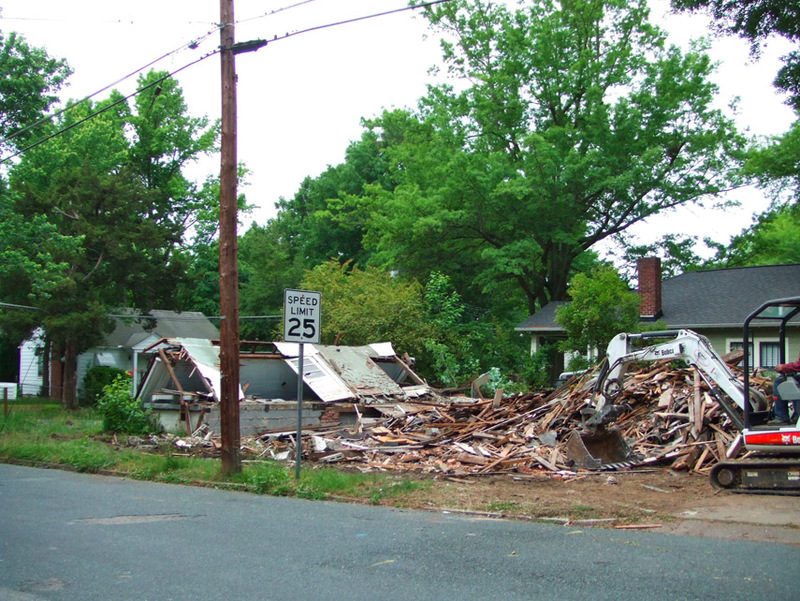 Jeff Monsein, aluminum baron of Durham, continues his reign of house replacement in Old West Durham with the demolition of 2700 Lawndale, seen above in 2006. I don't have any immediate history available on the house, but it was obviously an attractive little ~1900-1915 house. It appears none of the original mantels or other building materials were salvaged prior to demolition, an extraordinary waste. It appears that the success story of John Martin renovating the former 1704 Markham Ave into a beautiful little house on Edith St. was not particularly persuasive as a reproducible model to Mr. Monsein. Unfortunate. Elizabeth: I agree with you.